​Pie: delectable pastry or vehicle for social change? That’s Luanne Stovall‘s dream. 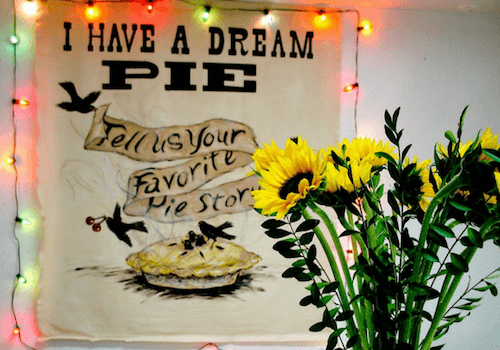 Luanne is an artist and founder of PEACE through PIE, a movement inspired by the dreams of another: Dr. Martin Luther King, Jr.
PEACEthrough PIE is rekindling the pie social to help further his work, and invites all of us to the table to share conversation and community around this flaky pastry. The idea of using pies and pie socials as vehicles for conversation and change evolved organically, Luanne told me. After hearing Dr. King’s “I Have a Dream” speech on MLK Day 1995, Luanne said she felt compelled to do something to not just honor the day, but to also engage in difficult discussions — “courageous conversations” — about the racial divide that still existed then, and even now.